After moving from Grenoble to Hamburg, I was looking for a new activity. I had spent a lot of my free time skiing and kiting. Deprived of the beloved mountains and snow, I was looking for a new activity conveying a feeling of independence and self reliance, where I could measure my endurance on geographic scales. Since some time already, I had secretly admired long distance cyclists and followed the scene. In my new situation, far from the mountains, I decided to give it a try. Yet during exactly this move from Grenoble to Hamburg, my road cycle got stolen while in the hands of the moving company. 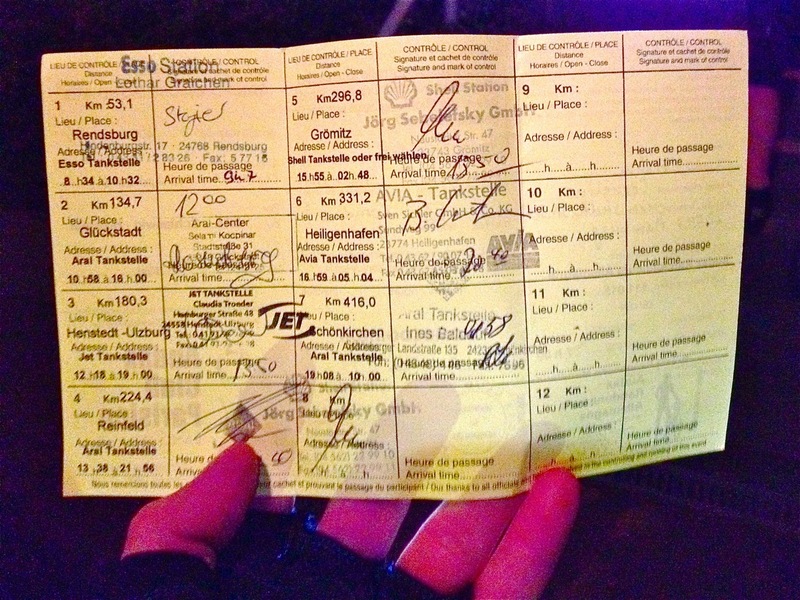 After my first two brevets on my city- and trekking-bicycle something had to change. 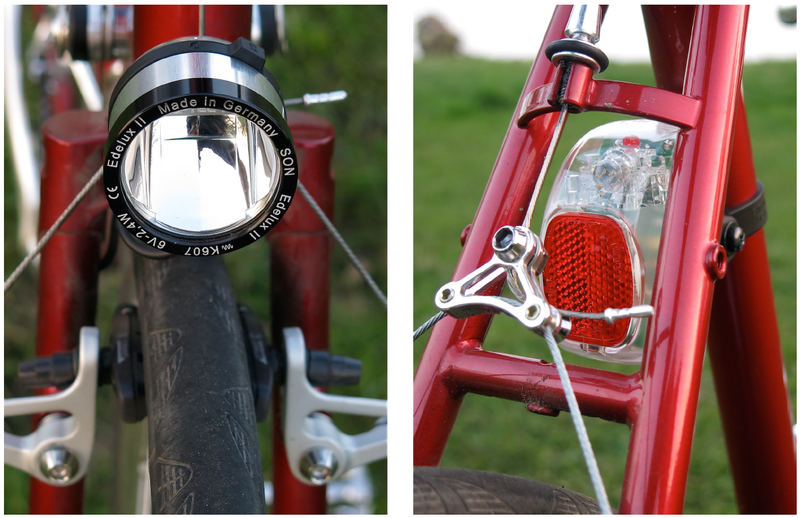 After some hesitation, I set my eyes on the Velo Orange Pass Hunter frame to build the new endurance bike to go the extra mile. The bike should be comfortable, accept at least 28 mm wide tires with fenders and 35 mm without, it should be capable to carry a moderate front load in a handle bar bag, and be attractive enough so I would enjoy riding it for a few hundred kilometres, and then some more. Among several reasonable choices, it was mostly the last argument that carried me away to choose the Velo Orange Pass Hunter over others. 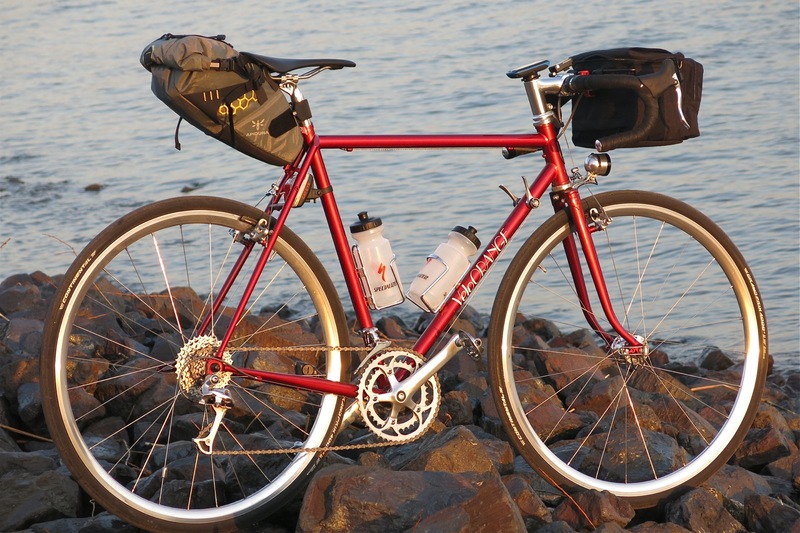 Its a steel frame with the necessary clearance, bridges, and eyelets for fenders, a nice rake to the mid trail fork, road rear spacing, reasonable weight, and - a number of quirky details ranging from the clean inline rack mounts, over the horizontal top tube to the wrap around seat-stays, the biplane fork, lug like steering tube flanges and lugged fork ends and rear dropouts. And it were those nifty details remotely reminiscent of the iconic bicycles of Alex Singer, Rene Herse and Jo Routens that finally tipped the balance. KlickFix Daypack, rear: Apidura Saddle Pack Compact. The wheels were build by Maro Moskopp from Radplan Delta. I was looking for a classic wheel set in a 3 cross lacing pattern, 28 spokes in the front, 32 in the rear. He took time and patience to discuss my request and insisted that I should consider the 23 mm wide Kinlin XC 279 rims, if I was serious about running those ridiculously wide tires from 28-32mm. He recommended a radially laced front wheel with 20 aero spokes and an asymmetric 8/16 lacing with aero spokes in the rear. Hubs. Front Schmidt Sondelux, rear Miche racing Hub. We settled for a compromise. The front wheel is build with 24 Sapim laser in a 2 cross pattern around a Sondelux dynamo hub. The rear wheel features sapim laser on the non-drive side and sapim strong on the drive side in order to balance spoke tension, laced in a three cross pattern on a Miche Racing hub. Tyres are Continental GP 4000 SII 28 mm mounted with Schwalbe SV15 air chambers. The wheels arrived more than one week earlier than promised, look beautiful, and their performance is superb, as far as I can judge until now. The drivetrain is a mix-match of various components, in an effort to combine reliability in the context of long distance cycling and travelling, a wide gearing range and the irrational desire to keep a classic appearance at an acceptable price point. Pedals are the brilliant Exustar E-PR43, mounted on Sugino XD2 compact cranks in 170 mm which are revolving on a Token JIS 103 mm square taper BSA bottom bracket. Sugino has quite a reputation for their cranks, but some aspects of the XD2 left me a little surprised. The finish on my sample looks, as if the forged raw piece was trimmed with a belt sander without attention for the subtle form where the spider transitions to the chainrings. The polishing stops already at the visible thin sides of the spider. The fiddly choice to hide one of the chainring bolts behind the crank-arm does not really appeal to me after only one change of chainring, and comes along with a milled recess at a place where the strain in the crank-arm must be very high. In addition, this choice of spider orientation does not allow to mount the bolt keeping the chain from falling in the gap with TA chainrings. Deburring on the inside of the spider was incomplete and needed touch-up. That said, the thread is as narrow as on older racing cranks, already from one meter distance it looks like the real thing, and in up to now it simply works great. Specialites TA chainrings of 48 and 36 teeth in the front transmit the power through a budget KMC chain to the Shimlano Deore/SLX 11-32 cassette in the rear. For really steep mountains, I keep a Gebhard 33 chainring in the parts bin, but here in northern Germany it simply wouldn't be of great use. This choice was based on my experience in the mountains and shows my complete lack thereof in the windy and rainy flatlands here. For fast group- and paceline riding at rather constant speeds, the gearing steps of the cassette feel uncomfortably big to me and I will likely give a 12-25 or 12-27 cassette a try very soon. they are designed for Shimano SPD clips. Brilliant. 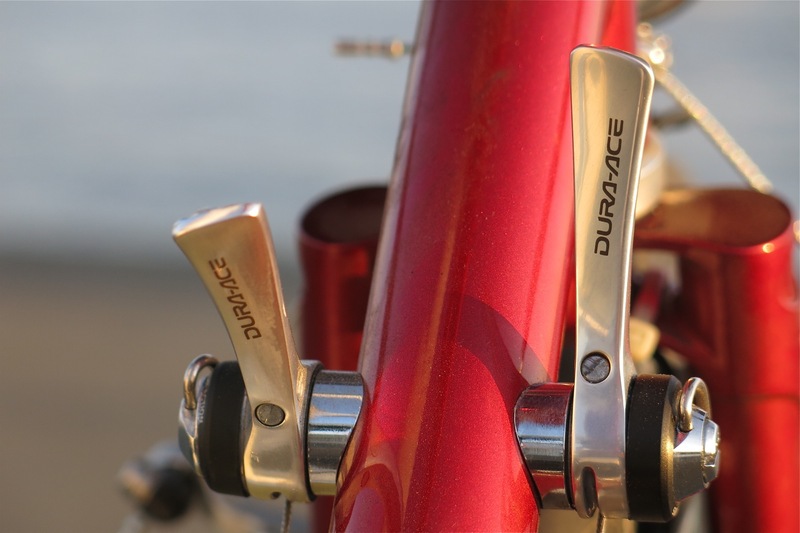 The decision for a 9-speed drivetrain and downtube shifters appears certainly anachronistic. But after giving it a second thought, and with my hands on experience it has some appeal: There is more cable pull per gear in a 9-speed system. With the exception of the last 20 cm for the rear derailleur, there is no cable housing, making the entire adjustment more stable and reliable. If indexing for the rear goes out of adjustment, it can be switched to frition shifting. The current gear is immediately felt by touching the shift levers even when riding at night. be disabled in case of adjustment problems with the rear derailleur. Neat. While I was lucky to get hold of a 'like new' Shimano Dura Ace FD-7410 front derailleur with a 28.6 mm clamp, the market for matching long cage rear mechs seems to be completely soaked up by enthusiast tourers and randonneurs willing to pay a fortune for these beautiful pieces of kit. 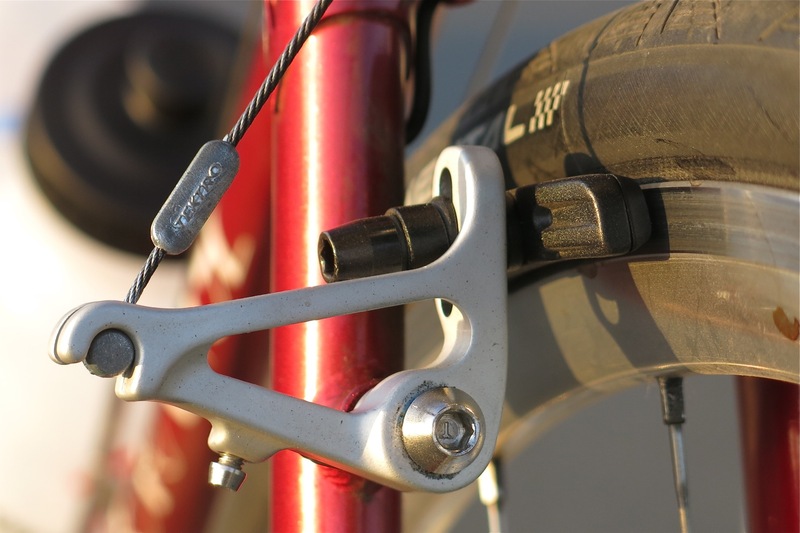 When I had already settled for a Shimano XT rear derailleur, ready to modify it with a barrel adjuster, I stumbled across the new SunXCD SXRD34M on Freshtripes component offerings. Possibly with the exception of small details, the SXRD34M appears basically to be an all silver, SunXCD branded Microshift RD-R51M. It perfectly filled a gap in my component list for this bike, but its a mixed bag considering its price tag: The barrel adjuster is plastic, the back plate of the parallelgram is a folded black steel plate with riveted articulations, and while the upper floating jockey wheel spins on a ball bearing, the lower one came with a simple bushing and had to make place for an aftyermarket part from Tacx on a ball bearing. But then, the shifting of the SunXCD feels crisp and precise, with the changed pulley it does not add any resistance, and it does look really great from some distance. 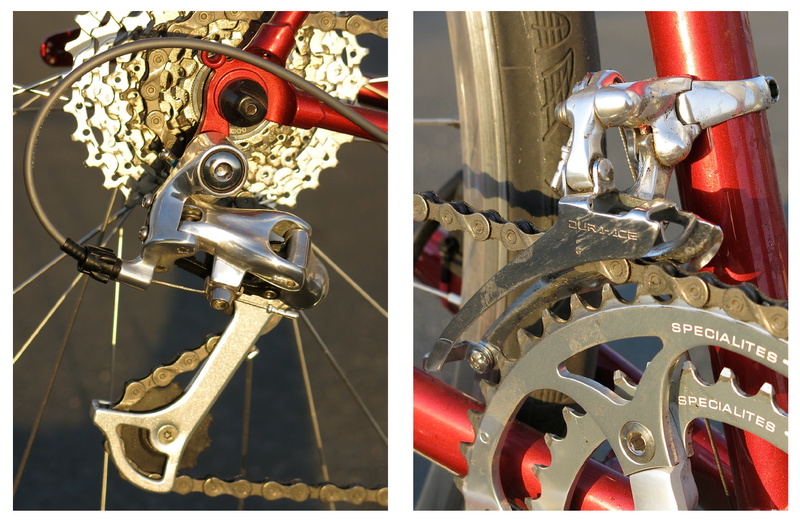 Rear derailleur: SunXCD SXRD34M. Front derailleur: Dura Ace FD-7410. Given unlimited funds, I would seriously consider a silver Campagnolo Athena 9 or 10-Speed setup with ergo power levers and a Compass Bicycle 'Rene Hersé' crank. One day maybe. 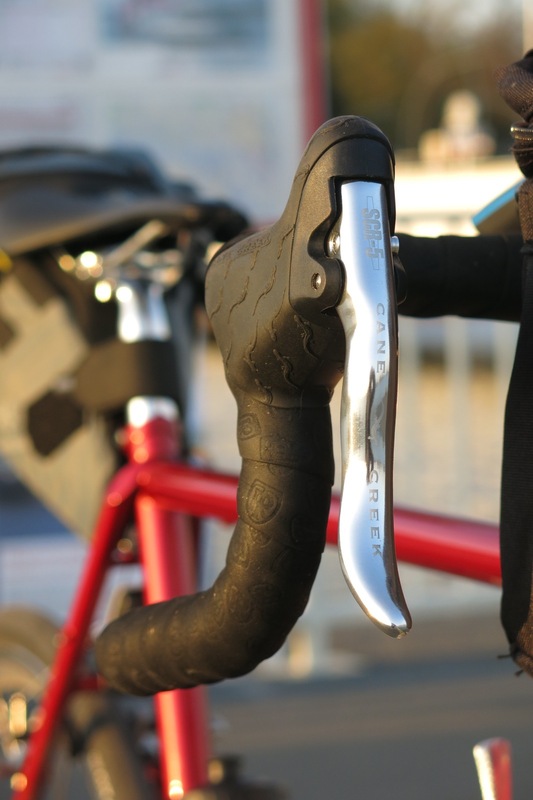 The Cane Creek SCR5 brake levers are equipped with a campagnolo style brake quick release which turns out very useful with the cantilever brakes. The Tektro CR720 are among the lightest, and at the same time also cheapest cantilever brakes on the market. in handy with the cantilever brakes. There is little more personal and maybe random hit or miss then finding the right saddle for really long rides. When the saddle of my city and touring bike broke down some two years ago, I just went into the next bike shop which happened to be a Specialized concept store and bought about their cheapest offering in the correct width. Eventually, this saddle went over many high alpine passes, through countless commutes and finally my first brevets without ever causing any real discomfort. When time came to choose a saddle, I simply went for the higher quality, harder, and less sticky 'Toupé' saddle from Specialized. The seatpost is Ritchey Classic, as is the handlebar, which is mounted on a VO Tall Stack Stem with 80 mm reach. The bar is rounded of with Ritchey bar tape and VO alu handlebar plugs. A Schmidt Edelux II powered by a SONdelux hub generator serves a s headlight, both marvels in finish and apparent manufacturing quality. Its touchy in angular adjustment, but once the position is correctly dialed in, a busy patchy beam pattern transitions to a very even flood, that is a pleasure to ride with. Avoiding a desaster in the looks and style department was worth patientl fiddling of the cable from the hub generator to the headlight through the forks vent holes. Waiting for intuition and time to implement a clean cable routing solution to the taillight (meanwhile done), a battery powered Cateye TL-AU100 ensures StVZO compliant visibility from the back and won a fight for seat tube real estate over the 'Pass Hunter' decal. It was chosen for its impressive claimed battery life, and solid mounting bracket. I have figured out a clean cable routing to the rear. For me its illusorical to even go on a daytrip without bike mounted luggage. I do not like to carry any things in my pockets the bike could carry. 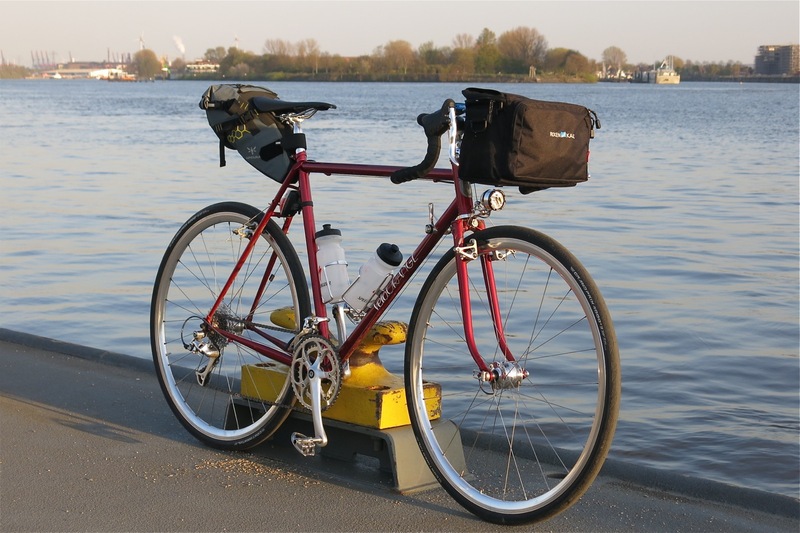 The Rixen und Kaul "Daypack" frontbag mounts with a clickfix adapter and keeps things accessible without dismounting the bike. An Apidura "Saddle Pack Compact" ideally complements the luggage capacity on longer rides without the need to install any hardware. (Revelate design has similar offerings). After riding my first two brevets on my city and trekking bike something had to change. I seriously doubted I could ride the longer distances without the help of an efficient bike. 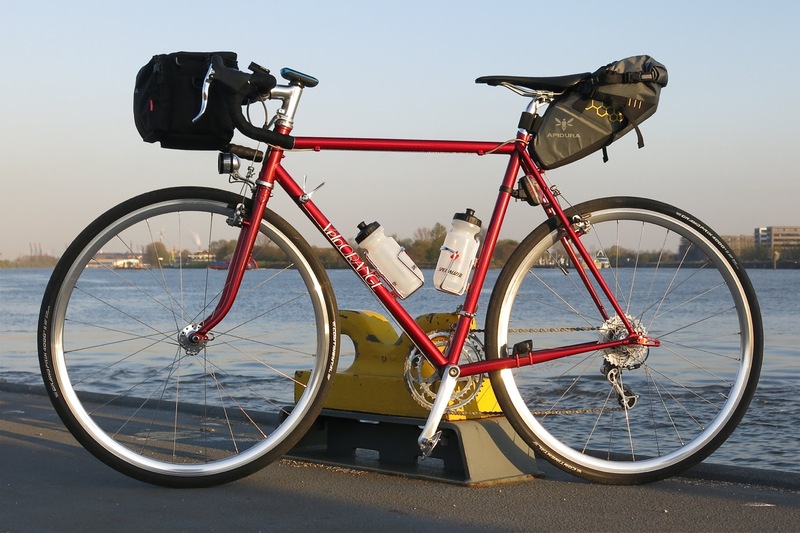 And when the frame arrived just barely in time for the next Brevet, there was no holding back ... With not even hundred kilometers of errands across Hamburg to complete last details of the build, it would have its true maiden voyage during the 400 km brevet in Kiel. its paces during a Brevet starting from Kiel. It performed admirably well. What a change! I no longer get compassionate compliments for strong legs, but rather for a beautiful bike. It performed admirably well. I have been asked about the bicycles weight. 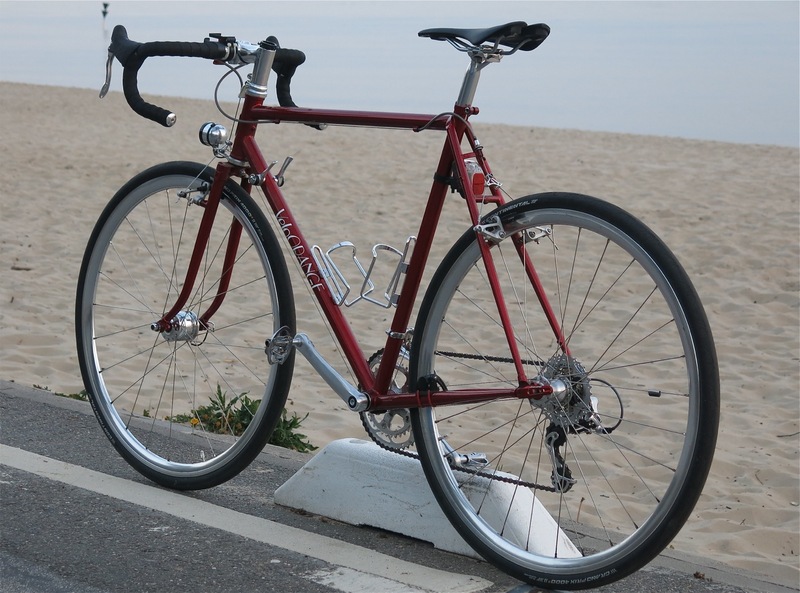 Its about 11.3 kg, with solid SKS fenders (added after the photo session). This is by no means heavy. And it anyway does not ride itself without a rider. If the fully rigged bicycle and rider were to tip the scale together, there is certainly room for improvement on my side and through thoughtful packing of food water and clothes. Just a point of clarification for UK customers. You are really better off dealing directly with Velo Orange's UK distributor, Mike at Velo Duo Cycles. Unlike other dealers (ahem), he responds promptly to emails, actually answers the phone(!) and if your item is not in stock, places the order with VO quickly. KS (no affiliation with anyone in the trade). Great looking bike! I am looking at this particular frame to build up as a randonneuring bike, and was torn between the 55 and 57 cm frames. Which size frame did you go with for your bike? I was torn between 55 cm and 57 cm and finally went for the 57 cm with an 80 mm stem, and meanwhile a zero setback seatpost. The short stem is nice with a bar mounted front load, but I think the 55 cm frame would have been fine too and probably more conventional. But then, on the other hand, with 170 mm cranks there is already a bit of toe overlap with the 57 cm frame with fenders. Sizing turned out fine, it got me across the brevet series and Paris Brest Paris, and I like it quite a lot. Could I please ask what has been your long-term experience with those Exustar PR43 pedals? The spindle looks so thin/delicate compared to a shimano a520 or a600 and also it looks a little long, like a cm or two longer than standard? 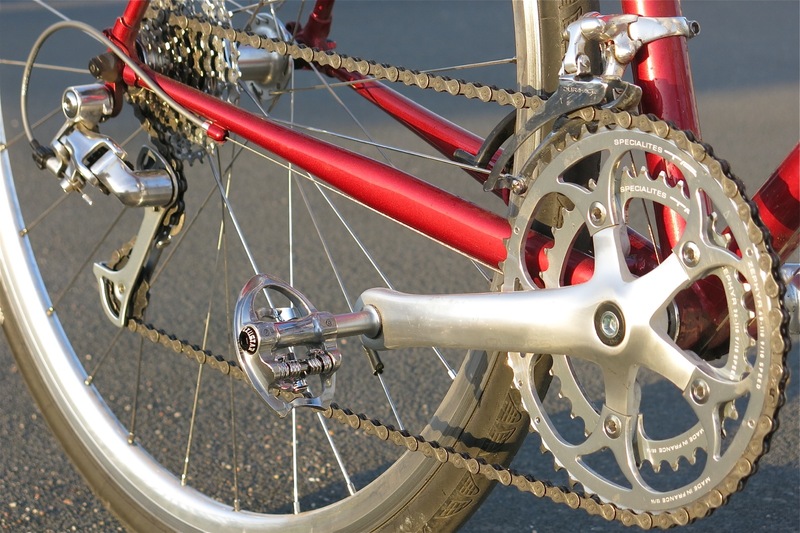 Do you find your feet stick out a little too far from your cranks? Or is that an illusion? Hi, sorry for replying so late. The stance (Q-factor) with these pedals appears overall a bit lower then with Shimano PD-A600 (have still not measured however). After a busy season, the bushing had run dry, and the ball bearings (only for lateral stability) were a little crunchy. After re-greasing they run fine again - probably need more regular maintenance. I currently use PD-A600, and transferred the Exustars on a vintage racer.